← Cold, cold, and more cold! I get asked a lot what I do in the winter time, so I thought I would share a bit of the “back room” stuff that goes on. I work quite a bit on preparing for the upcoming growing season. We are using more and more variable rate equipment in out operation, so I have to spend time building the maps for that. 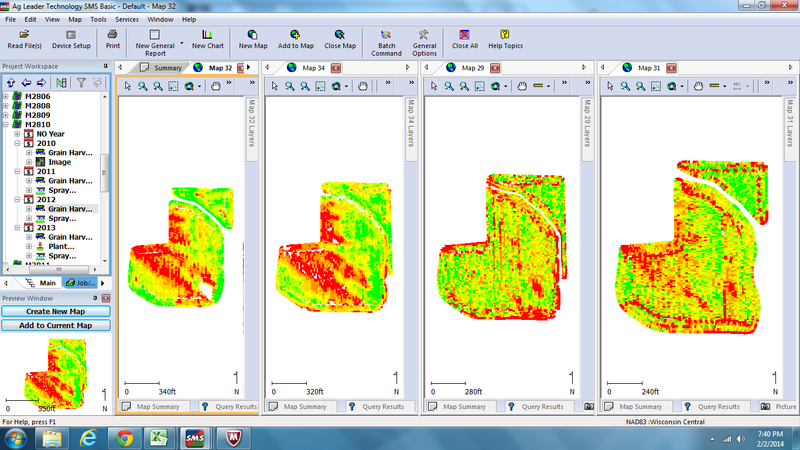 We soil sample based off of soil type maps (like above) so I enter the soil sample results into the program. 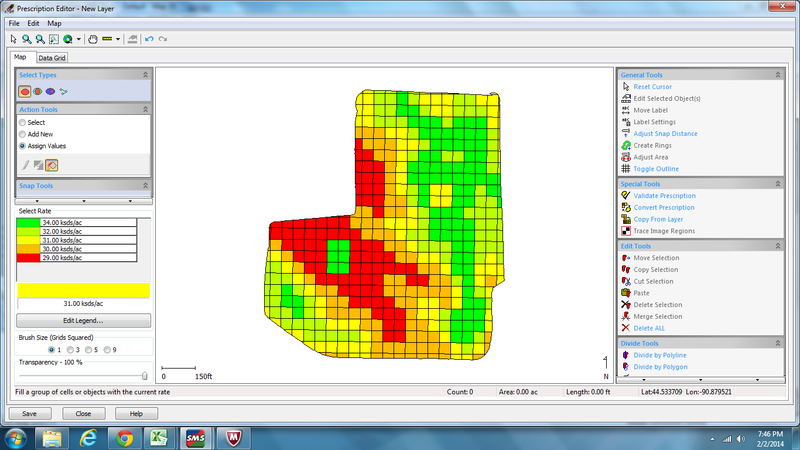 Using the soil type maps combined with the soil sample results I can make application maps. Above is a lime application map. This map will be downloaded to the controller in the lime spreader, which will vary the rate using GPS as the operator drives across the field. This will help assure that the PH of the soil will be balanced across the field, without over applying in some areas, and under applying in others. I also work on variable rate planting maps. I make these slightly differently then a lime application map. 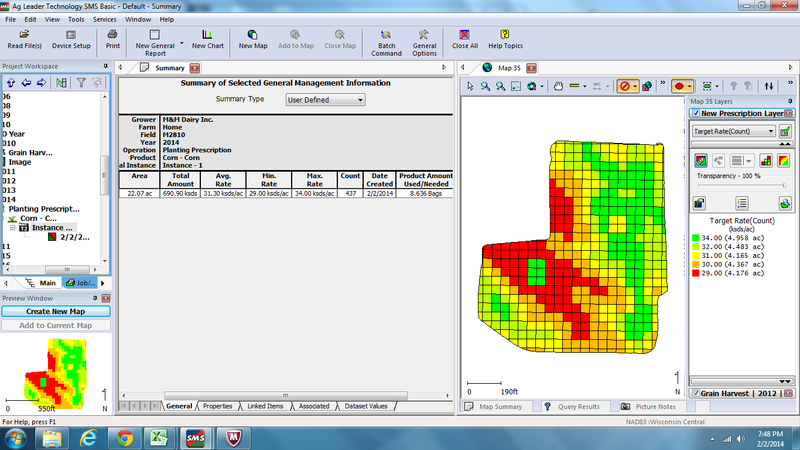 The first thing I do is look at as many yield maps as we have available. For this field I have 4. I look for similarities from year to year. 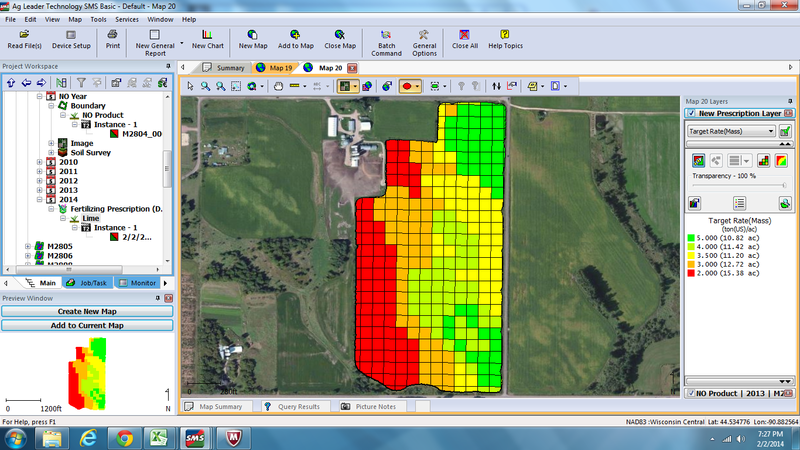 From here I start to build “zones” in the field based off of yield history, soil type, and knowledge of the field. Once I have my zones I start to make a planting map based on those zones. Once I make a zone I can easily edit it to place test blocks with in my zones, to see if my rates are correct. 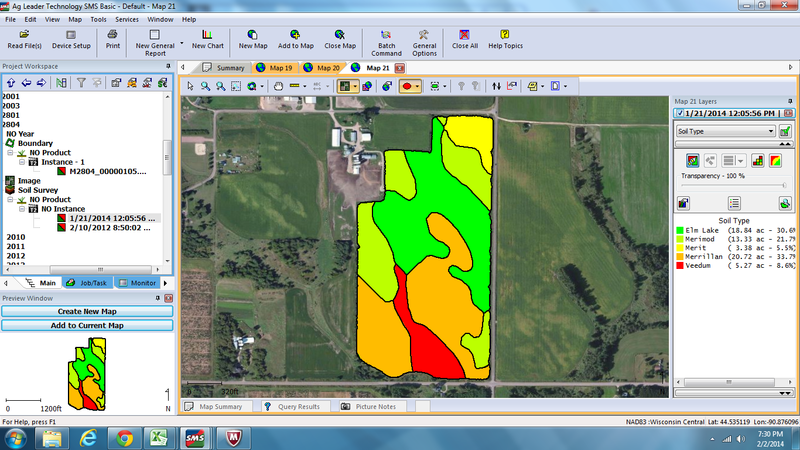 I will compare this map to the harvest map in the fall to make sure my zones are correct. You can see a test block in the middle of the red zone as well as in the middle of the green zone. If I see a yield increase while going over those zones with the combine, I did something wrong, if the yield goes down or stays the same, I am on the right track with my variations. Each year is a learning experience! Once my rate map is a complete, I can view a summary which will show me max, minimum and average rates. As well as the amount of product we will use (in this case, bags of seed corn.) Once again, this map will be downloaded to the corn planting tractor, and the tractor uses GPS to automatically make the variations as the operator drives across the field. 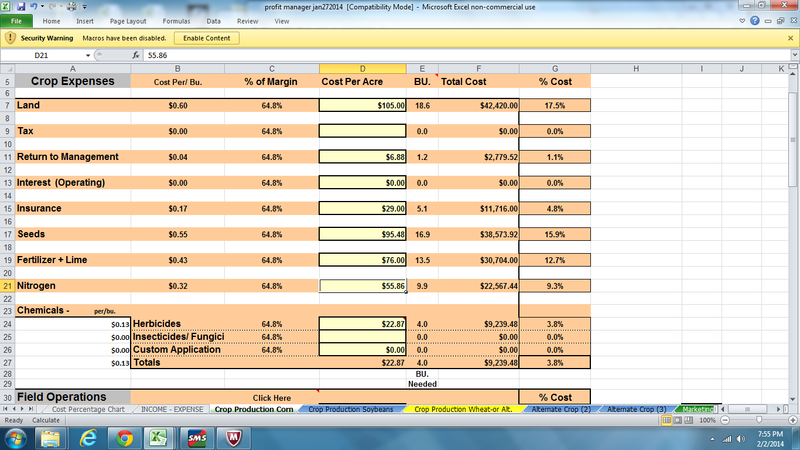 Another project I work on is making sure we know exactly what our cost of production is. I Purchased a spreadsheet to help me with this. Please ignore the numbers, most of them aren’t correct right now, but it gives you an idea of what it includes. As you can see, I put in the cost of each of our inputs (land cost, fertilizer, seed, etc) as well as the cost of our equipment, how much it cost to make each pass across the field, cost of handling grain, etc. 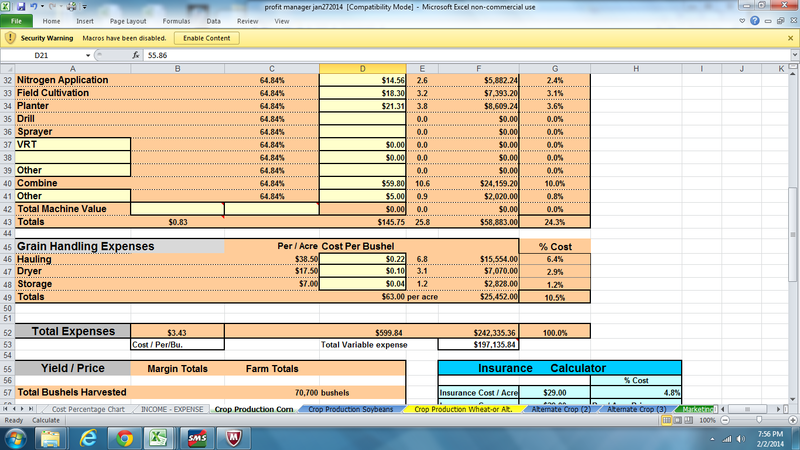 Then we put in our yield and other information, and it calculates the price per acre and bushel of each operation. Farming has become as much about managing margins as anything. This tool helps us understand exactly where our break even prices are, as well as help us show where we need to make improvements. 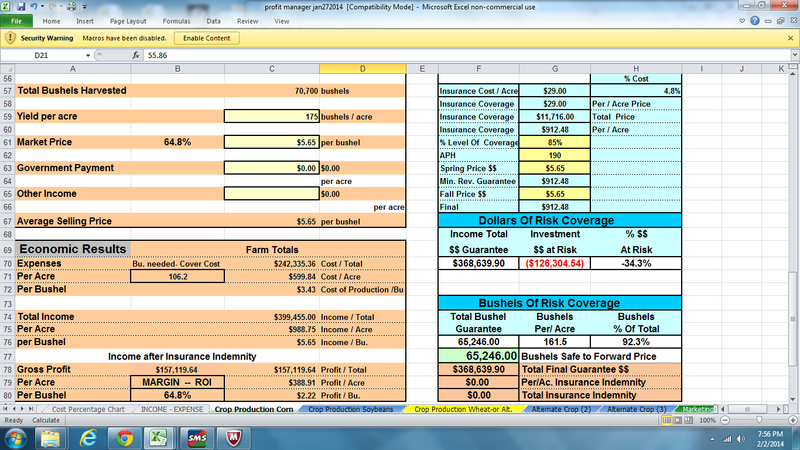 I do one of these spreadsheets for each crop that we grow. I know this isn’t the most exciting stuff in the world, but not everything we do is that exciting! Hope everyone is making it through the winter ok, I know I am ready for spring! This entry was posted in Agronomy, General Information, Machinery and tagged agriculture, agronomy, corn, crops, factory farming, family farm, family farming, farmer, food production, Modern Agricuture, modern farming, organic farming, Production agricuture, sustainable agriculture, tractors, wisconsindairy farmer. Bookmark the permalink. 21st century farming indeed! Thanks for sharing.